Dorchester has lost a longtime civic and business leader with the death on Dec. 14 of Loretta Philbrick at age 81. She had suffered a stroke in her home earlier in the month. 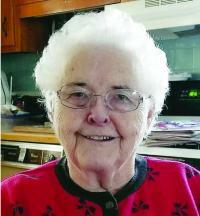 Ms. Philbrick was a steady presence in the neighborhood’s banking industry. She began her career as a teller at the former Dorchester Savings Bank, which later became First American Bank for Savings in 1977, and retired as a vice president of the institution. A familiar face in the neighborhood’s lively civic scene, she was for decades an election day worker at Florian Hall. She also served on the board of the Cedar Grove Civic Association and was a longtime director and former president and treasurer of Cedar Grove Cemetery. Ms. Philbrick was the daughter of the late Gardner and Dorothy (Driscoll) Philbrick. Her mother died just six years ago, at age 102. She leaves her sister, Dorothy M. Canniff of Weymouth, and nieces and nephews Susan Stanley, of Boulder, CO, Richard Canniff, of FL, and John Canniff, of Weymouth. She is also survived by several grand nieces, grandnephews, and cousins. Visiting hours have been set for Wed., Dec. 19, in the John J. O’Connor & Son Funeral Home, 740 Adams St. Her funeral Mass will be celebrated in St. Brendan’s Church on Thurs., Dec. 20, at 10 a.m. with burial in Cedar Grove Cemetery to follow. In lieu of flowers, remembrances may be made in Loretta’s name to a charity of your choice.